This is a rare disorder where the system used by the body to regulate water levels becomes disrupted. 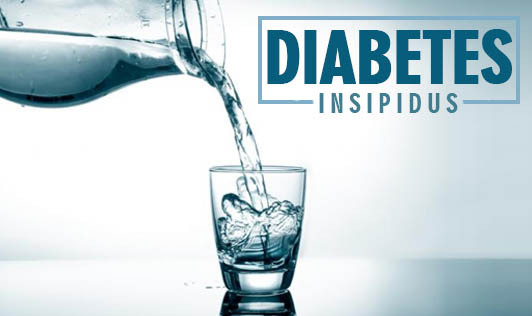 Diabetes Insipidus is characterized by intense thirst, despite drinking fluids, and excretion of large amounts of urine. In most cases, this is the result of one's body not properly producing, releasing or storing a key antidiuretic hormone (vasopressin). Diabetes Insipidus can also occur when one's kidneys are unstable to respond to that hormone properly. The most common symptoms of Diabetes Insipidus are extreme thirst and excretion of an excessive amount of diluted urine (up to 20 litres a day). These are accompanied by a feeling of being unwell due to an increase need to use the bathroom making one always feel thirst; sleeping patterns and daily activities may be disrupted as a result. In children and infants, the symptoms of Diabetes Insipidus include bed-wetting, loss of appetite, feeling tired all the time, delayed growth and weight loss. If you find yourself feeling thirsty all the time, passing urine more than normal, contact your doctor. While it may not necessarily be a result of Diabetes Insipidus, it should be investigated!